posted by Matthew Bushey, AIAAt the lighting exhibit that was held in our office earlier this year, we had the fortunate opportunity to evaluate and compare many of the newest lighting fixtures on the market. One of the goals of the event was to show products that were not just adapted for LEDs, but ones that used the characteristics of these new technologies to influence the design of the fixture itself. We had a variety of fixture types and styles on display, but the one category that I felt best captured the promise of what LEDs can do for lighting fixture design was the workplace task light. It makes sense that personal task fixtures are the first beneficiary of LED lighting, when you consider the fact that LED modules are a very focused point source of illumination, perfect for directing bright light onto a small, specific area. They’re also not cheap (although the prices are dropping rapidly), so it’s easier to absorb the cost of LED technology into a $300 task light than a $50 recessed downlight, for example. And finally, the companies that are producing most of these task lights have the intellectual and creative firepower to invest in the development of these new products. I’m talking primarily about the Big Three (Steelcase, Herman Miller, and Haworth), and I always love seeing what they are coming out with next. These five fixtures are good examples of the best designs in personal task lights. And they all happen to use LEDs. The Link Lamp is a contemporary reinvention of the iconic task light, and it was my favorite fixture we had on display. Designed by Peter Stathis for Pablo Designs, the lamp features 15 LEDs that consume just 7.5 to 9 watts of power. Stathis started with the classic task lamp and simplified its mechanical complexity, stripping away the tension cables and wiring. The head is a flat disc, with no need for a shade, and there is no internal wiring: the power is conducted along the aluminum body. The die-cast zinc base is shaped into an L to fit into the corner of your desk, the aluminum body is highly adjustable, and the diffused LEDs have two brightness settings. The Link is an efficient, sustainable, cradle-to-cradle design, and the form is simple and elegant. The Link Lamp won best lighting award at the International Contemporary Furniture Fair when it was released in 2008, and has been heaped with acclaim since then. At our exhibit, I had it on display next to the classic Tolomeo (see below), to really appreciate the evolution of the design. It’s fair to say that this one is destined to become a classic as well. 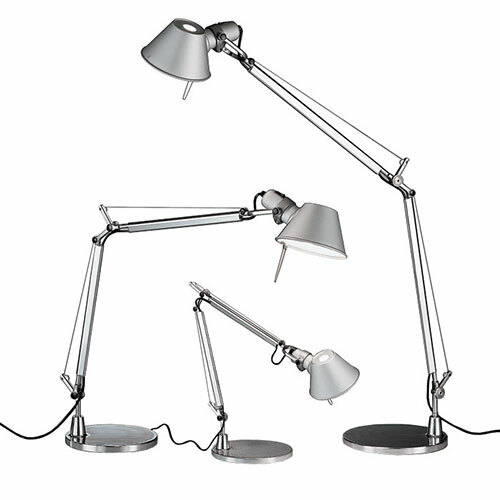 The Tolomeo task light by Artemide is a modern classic. A symbol of Italian design for more than 20 years, this fixture has become one of the most recognizable task lights in the world. I think of this as the “Aeron chair of task lights”, with its contemporary articulated armature and its coming of age during the high-tech dot-com years. It is a beautiful and expressive work of industrial design. One disadvantage of the conventional model is that the shade surrounding the incandescent bulb gets very hot. 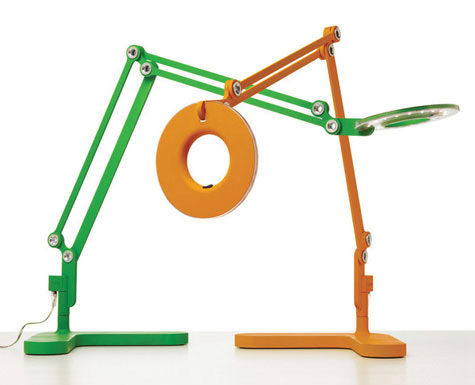 That problem was solved when Artemide came out with this new LED version of the classic Tolomeo. LED lamps do produce heat, but the heat is conducted out the back and not radiated forward, as an incandescent bulb does. With a properly designed housing, this heat can be easily dissipated. The LED Tolomeo also provides superior light output and energy efficiency, consuming just 10 watts of power, making it as sustainable as it is timeless. Herman Miller is known for beautifully sculpted objects, and the Leaf Light is a perfect example. This was perhaps the most popular fixture at our lighting show, grabbing everyone’s attention with its sculptural, organic form and flexibility. The 9 watt LEDs are controlled with a clever interface in the top of the round base. By dragging your finger along the touch-sensitive grooves, you can change the color and intensity of the light. The thin aluminum blades of the body are movable as well, allowing for an unlimited number of turns and positions. The Leaf Light was designed by Yves Behar and released in 2006. It is already over 4 years old, (a lifetime in the world of LED lighting) but it’s still holding on to its position as one of the top task lights in design and operation. Designed for Haworth by Pablo Designs, the Brazo Lamp is another fixture that is highly adjustable by the user. It features LED lights with full dimming control via the knob at the back end of the arm. It is the first task light to offer focus control – the simple rotation of the glass tube dial located at the front of the shade changes the direction and the beam spread of the light. The lamp also features 360 degree head rotation and height adjustment. Overall, it consumes just 9 watts, but because of the linear arrangement of the LED modules and the multitude of available adjustments, this fixture shines the right amount of light where you need it. Details is part of the Steelcase family, and they named this line of fixtures SOTO for “State of the Office”. Of all the fixtures we’ve been looking at, the SOTO LED task light is even more simple and minimal in its design. This is possible because LED modules are SMALL. There is no bulb or filament or glass housing to deal with. LEDs are an electrical diode, an offshoot of the semiconductor industry, and take up a fraction of the space that we’re used to with conventional bulbs. It’s a liberating technology for the design, because it frees up the fixture to be so much more… or in this case, so much less. Just like the flat head of the Link Lamp or the thin blades of the Leaf Light, the SOTO Task Light is defined by its minimal profile. The switch to control the light is built into the side of the head – you just slide it slightly to turn it on. The beauty of this fixture comes from its simplicity of form and operation. The SOTO Task Light wins the low-power competition, coming in at a measly 4 watts. The SOTO comes as a freestanding fixture (shown) or a rail-mounted version. The Mini SOTO is an even smaller option that is able to be mounted via magnet or screws to the underside of a cabinet or shelf, providing illumination in spaces that might not be reachable by typical under-bin lighting. The Mini SOTO is just 7” x 5/8” x 1 3/8” and also uses a 4 watt LED.